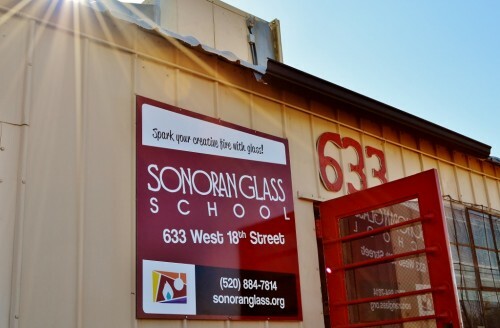 Sonoran Glass School is a 501(c)3 non-profit, public-access educational organization. 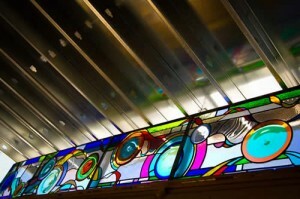 Our mission is to inspire people of all ages to discover the wonder of glass art. Sonoran Glass School is a 501(c)(3), non-profit educational organization that exists because of donations, public grants and private support. We are a community of individuals dedicated to fostering glass as an exciting and thriving visual arts medium in Tucson. Proceeds from our classes, membership dues, gallery sales, and events support the education and advancement of glass art and glass artists in Southern Arizona. – Thank you. Founded in 2001, Sonoran Glass School began as the dream of a small group of local glass artists in possession of a dilapidated tire changing station in the outskirts of downtown Tucson. Over the past 14 years, we’ve grown into something truly special. Thanks to our supporters and volunteers, we built four studios, each dedicated to a different glass art medium, including furnace glassblowing, lampworking, kiln-fusing, and coldworking. Today, we’re a full service glass arts educational facility and the premier public access glass arts educational facility in the desert Southwest. Year-round, we provide educational opportunities to the general public through classes for local beginning and intermediate glass artists, workshops from visiting artists, and community events. A gifted team of faculty instructors teach glassblowing, torchworking, kiln-firing, mosaic, stained glass, coldworking and other glass art disciplines and techniques. We keep our class sizes small, in order to provided maximum 1-1 attention while providing exciting Make Your Own Glass Art experiences for beginners, groups, and kids aged 5 and up all year-round. We aim to increase our students’ knowledge of glass as an arts medium, as well as to boost their confidence, creativity, and artistic capabilities. We also design specialty classes to expand Tucson’s exposure to both up-and-coming and world-renowned glass artists through lectures, demonstrations, and intensive workshops. Our programs are rooted in education and public awareness of our mission, and fall into three basic categories. Youth Programs-We provide Tucson-area schools and youth organizations, elementary through high school, glass art programs each year subsidized by generous grants from the NEA, TPAC, and the Arizona Commission on the Arts. As of Spring 2014, over 4,800 students have walked through our doors and received educational experiences, demonstrations, and courses in glassblowing, torchworking, and/or kiln-firing at a free or reduced cost. College Programs-Partnerships with the University of Arizona and Pima Community College allow SGS to offer furnace glassblowing courses for college credit (ART 265) to Tucson’s collegiate community. Community Outreach-Through programs for Veterans, like the 33rd Boro Platoon, and lectures and experiences with senior groups like OLLI-UA (Osher Lifelong Learning Institute at the University of Arizona) we expose new populations to the wonder of glass art. SGS is open year round and we welcome visitors to browse our gallery and sculpture garden and watch classes (when in session). Our gallery displays beautiful art glass gifts and sculptures made by faculty, students, and visiting glass artists. Gallery sales support our non-profit organization. Your safety comes first, so we require every student at SGS to wear closed toed shoes. Safety glasses are required for some classes (which we’ll provide). Please wear comfortable, cotton clothes that you don’t mind getting dirty, just in case. Depending on the class, students should also tie long hair back and avoid wearing dangling jewelry. SGS is proud to be a fully equipped glass art educational facility, home to a Hot Shop, Flame Shop, Warm Shop, and a newly expanded Cold Shop. Our Hot Shop features a 400 pound Hub furnace, 3 glory holes of varying sizes, 3 large kilns, a roll up kiln, 2 Paragon color boxes, and 3 work benches. Our Flame Shop is equipped with 8 Nortel major/minor burners, 3 Paragon kilns of varying sizes, plenty of hand tools, and an assortment of Borosilicate, 96 COE, and Effetre glass. Our Warm Shop includes 4 large work tables along with additional outdoor workspace, 3 22″ Paragon kilns, 3 large bathtub kilns, a variety of small AIMS “igloo” kilns, plenty of hand tools, and an assortment of fusible and non-fusible glass. Finally, our Cold Shop features an upright grinder, grinding lathe, bench grinder, 3 24″ grinding wheels, 1 8″ grinding wheel, 3 wet saws, ring saws, large sandblaster, and small engraving tools.